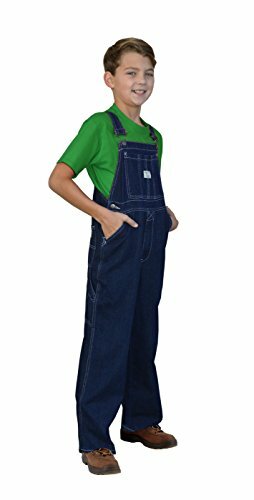 Brand: DAVIS' MEN'S STORE, INC.
West End Blues Boy's Kid's Soft Washed Denim Bib Overall This 2 piece soft washed denim bib overall set by West End Blues is perfect for your next dance performance or school play. Kids love to wear these overalls! The adjustable straps give you ease and comfort. With plenty of pockets for storing all their stuff, the front bib pocket can hold a media player which can be kept secure with the snap closure. A soft cotton t-shirt completes this set with style! Available exclusively at Davis' Men's Store, davisbigandtall.com, and overallwarehouse.com. Bib overall 100% Soft Washed Cotton Denim Button side closures Adjustable shoulder straps Suspenders are easy hook Rivets on pockets for added durability Bib pocket with logo ribbon Two back patch pockets Utility pocket on right side Bartacked stress points Machine wash, tumble dry Zip fly T-shirt 100% cotton Crew neck Short sleeves Style # SET-1862-KG West End Blues Childrens Sizing Chart Size Waist Length 2T 24 13 3T 24.5 15 4T 24.5 17 4 26 18 5 26.5 19 6 26.5 20 7 28 20.5 8 28 22.5 10 29 24.5 12 29 26 14 30 28.5 16 32 31.5 18 32 33.5 *Sizing chart is a guide to help you select your size according to your body measurements. If you have any questions about this product by DAVIS' MEN'S STORE, INC., contact us by completing and submitting the form below. If you are looking for a specif part number, please include it with your message.